What can you do at 9,100 feet? SADDLE UP – Horseback Riding! Seasonal (Memorial Day through Labor Day) White Mountain Horseback Riding offered by Chuck’s Trail Riding Adventures at Hannagan Meadow. Take an adventure on a horseback trail ride through the tall pine forest over picturesque back country mountain trails. Horseback riding is our game, so come out for horseback trail ride today. Our wranglers will be happy to provide you with a trail ride the cowboy way, that you’re sure to remember. Book rides online for Chuck’s Trail Riding Adventures at Hannagan Meadow here! Whether you’re in Alpine, Springerville, Eagar, or Nutrioso, Arizona, come out for horseback riding that you will enjoy. We offer you the best in horseback trail rides through the pine, aspen and oak tree covered mountains while in the Apache National Forest. Check out the deer and wild turkeys in some of the prettiest country in Arizona. Make sure to have your camera handy to catch your experience to show what your friends missed out on. 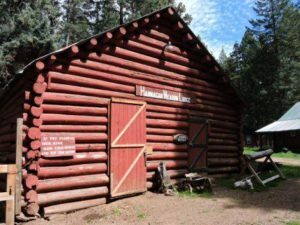 You can find us right off the Coronado Trail (also known as U.S. 191) located 22 miles south of Alpine at the Hannagan Meadow Lodge. We are easy to find and look forward to your horseback ride with us soon. If you head into the lodge, they will send you down to the Barn. Keep in mind that Hannagan Meadow is at 9,100ft, so it’s cooler for horseback riding. During the summer months, it’s best for morning time horseback rides. In the afternoon, it depends on the weather. Rain may come around 3pm so plan accordingly. We can ride in light rain but not when it is lighting, which is for your safety.